Whenever possible, I always pay with my credit card. Credit cards offer an incredible amount of protection, benefits, and rewards. Earning credit card sign up bonuses is one of the fastest and easiest ways to earn the most cash back, miles, or points. Sign up for a card, meet the minimum spend requirements, and earn the big bonuses. Airline miles and hotel points will let you travel all over the world for next to nothing. BUT, you have to be wise about your credit decisions. When deciding to apply for a new credit card, the first thing you need to check is your credit report and score. 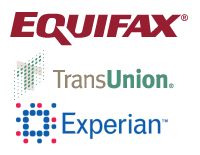 The 3 major credit reporting agencies (CRAs) are: Equifax, Transunion and Experian. You can get an official copy of your credit report from each CRA at www.annualcreditreport.com once a year. Your annual credit report doesn’t give your actual FICO score, but allows you to check for any mistakes on your credit report. Up to 25% of all credit reports will have a mistake on them, which could affect your credit score. I recommend requesting a report every 4 months from each of the CRAs. That way you can monitor your updated credit report throughout the year. If you want your real credit score, go to www.myfico.com to purchase your Transunion or Equifax score for $19.95 each. Sometimes they have promotional free trial offers. These companies will perform a “soft pull” inquiry of your credit report to generate a simulated credit score. Updating your FAKO score will have no effect on your credit score. I’ve found that my FAKO scores correspond closely to my real FICO scores. Once you make sure you have an adequate credit score (740 and above is considered excellent) and no mistakes on your credit report, you can consider applying for new credit cards. If your credit score is low, you may need to work on improving your credit prior to applying for new credit cards. Next, decide on what type of rewards you are interested in. Are you looking for a credit card that gives you cash back, flexible points, airline miles, or hotel points? If you are new to credit cards, or have a young credit history, it is best to apply for credit cards slowly. Applying for too much credit at once can damage your credit score by lowering your average age of credit accounts. For credit beginners, I would recommend applying for only 1 or 2 cards at a time. Then you can see how your credit score is affected. Typically your score may drop 5-10 points for each “hard inquiry” shortly after your credit application. After a few weeks, your new mix of credit will start to actually improve your credit score slowly. Once your credit history starts to build several months later, you can consider applying for more credit cards. If you are looking to buy a car or a house within the next 6 months to 1 year, I would advise against applying for new credit, especially if you don’t have a long credit history with a good mix of accounts (student loans, personal loans, credit cards). When I refinanced my home recently, I had to explain in writing why I opened up 2 new credit cards within the last few months. I told them that it was for starting a new business (which was true). In any event, I would be extra cautious about applying for new credit cards if there is a chance it could hurt your opportunity for securing a new car loan or mortgage at a good interest rate. If you haven't checked your credit report or credit score lately, now would be a good time. A future article will go over my favorite credit cards, and I will give you a peek at what’s in MY wallet. In the meanwhile, make sure you read my post about how to avoid getting overwhelmed with credit card debt.